If you love golf then Naples might be a great place for you to live. The area is filled with golf courses, including many that are the heart of the developments in which they are located. Some are executive courses that cater to older golfers, some are championship courses that will test even single digit handicaps. One of the top courses is the Tiburón Golf Club which was designed by Greg Norman. Maple's walk-able downtown are beautiful residential streets, conveniently situated next to the white coral beach that goes for miles. The downtown neighborhoods are lovely and feature both private homes and small condominium associations. Golf courses are just about everywhere, but tend to be more on the Bay side of town. There are many active adult communities in Naples of all types. In fact Topretirements has reviews of 40 or more in our Directory (see link at top right). The National Association of Realtors reports the median sale price of a home in the Naples/Immokalee/Marco Island area to be $465,000 for the second quarter of 2018. Many homes near the beach and in waterfront developments will sell for much more than that. 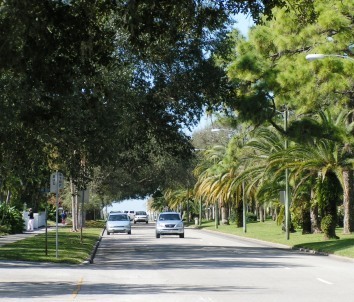 • Naples Beach and adjacent neighborhoods • Charming and upscale downtown area • An upscale development for everybody • Active cultural life • an affluent and prosperous town • Corkscrew Swamp Sanctuary is a huge preserve • Naples claims it has more golf holes per capita than any other town in the country. Oppressively hot, humid summers; traffic is intense and only going to get worse; really high prices, although they have fallen lately; everybody seems rich. Naples is the west coast of Florida, with many bays and waterways. It is on one of the best beaches in the world. The terrain is flat and tropical. Warm winters and hot humid summers. Naples has been listed as one of the top small art towns in America. The Naples Players, the Naples Philharmonic Orchestra, The Philharmonic Center of Naples, and the Sugden Theater are just some of the cultural attractions in Naples. If that isn't enough it is less than an hour away from more theatres in Ft. Myers to the north. There are various community and dinner theatres. The libraries are first rate and artists thrive in the many art galleries. Crime in Naples is a little less than two thirds the national average. In addition to Naples Community Hospital, the Cleveland Clinic has a facility in Naples. Sometimes it seems like every other building houses a medical practice or facility - there is no shortage of medical care here! The city is served by the Naples Municipal Airport and the Delta Connection, which flies to Atlanta. Southwest Florida International Airport, in South Fort Myers is just a short trip up the Interstate. Most of the low-cost carriers are there, offering convenient non-stop service to many destinations. Car traffic is intense in season. Downtown Naples is way above average in walkability when compared to other communities, but once out of the downtown that is not so.